Specialised naval architecture services to the marine industry. Combining an inherent knowledge of sailing, boating and shipping operations with theoretical naval architecture and computer analysis allows the most efficient and practical solution to be applied to your design. Experience ranges from high speed rigid inflatables, yachts, workboats to stationary working barges. 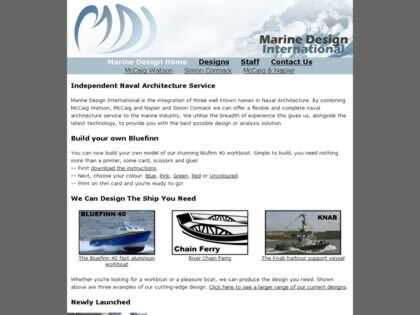 Web Site Snapshot: If available, above is a snapshot of the Simon Cormack Limited Naval Architecture web site at http://www.marinedesign.co.uk/ as it appeared when this site was added to the directory or last verified. Please Note that Boat Design Net has no involvement with the above web site; all content and images depicted in the above thumbnail are the property and copyright of Simon Cormack Limited Naval Architecture unless otherwise noted on that site. Description: Specialised naval architecture services to the marine industry. Combining an inherent knowledge of sailing, boating and shipping operations with theoretical naval architecture and computer analysis allows the most efficient and practical solution to be applied to your design. Experience ranges from high speed rigid inflatables, yachts, workboats to stationary working barges.